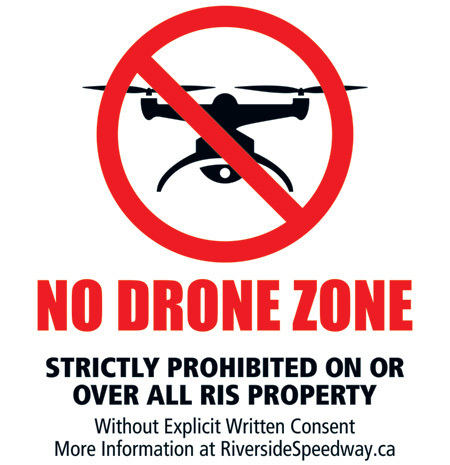 Riverside International Speedway Inc. (RIS) strictly prohibits the use of any unmanned or remote-controlled aerial vehicles/aircraft (UAV), also known as a drone, on or over RIS property without the explicit written consent of the owner of RIS. The application must be made in writing at least 21 days prior to use and include name of applicant, date/s of use, purpose, proof of operator/s certification and proof of insurance that meets or exceeds RIS requirements. Inquiries and/or applications should be sent to novaconstruction@ns.sympatico.ca. RIS personnel will remove anyone using an unknown UAV on RIS property and/or confiscate the UAV and/or notify law enforcement.